In a Facebook post published the day after campus club Youth Protecting Youth (YPY) held a public anti-abortion demonstration in the quad outside of the McPherson Library, the University of Victoria Students’ Society criticized the university administration’s handling of the situation. 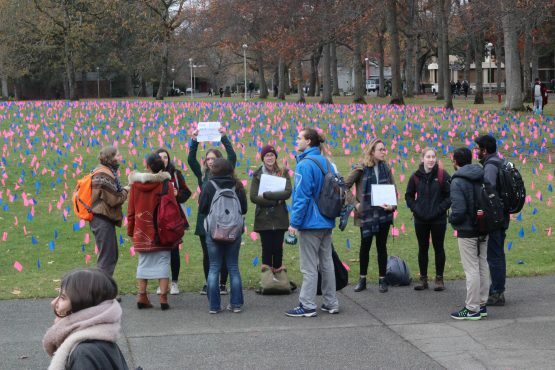 The demonstration included the planting of 10 000 pink and blue flags, each of which, according to a press release from YPY, represent 10 abortions that happen in Canada every year. The flags were removed five hours after they were planted by a group of twenty counter protesters. 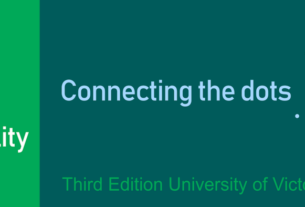 The UVSS’ criticism stemmed from a lack of warning from the university. “Due to the fact that we are held legally liable for the actions of clubs which has previously caused issues with certain clubs, the University has a policy where they give notice when a club has booked one of their spaces,” the statement read. John Derry, associate director in the Office of Student Life, Division of Student Affairs, made a statement apologizing for the miscommunication. The UVSS weren’t the only group contacted by UVic on Wednesday. Cecilia Fillipone, president of Youth Protecting Youth, told the Martlet that her club had applied for a permit to demonstrate on Nov. 2 but were also only given the go-ahead the day before the demonstration was scheduled.